Taking CNA classes in Michigan is what you need if you are planning to be a successful certified nursing assistant someday. However, being a successful Michigan nurse aide lies in going to a college, university or center that only provides approved nurse aide training or CNA classes in MI. 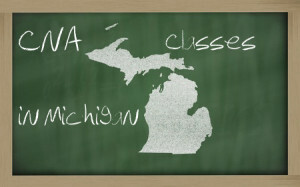 There are known schools that offer CNA classes in Michigan. Among the top schools in Michigan that provide CNA programs for a student aspiring to be nursing assistant are the Hazy institute of learning, Ross medical education center, DRM international learning center, and Kellogg community college. Another place that offers CNA classes in Michigan is the American Red cross training center. Let us take a look at the various schools that offer CNA classes in Michigan to help you understand the CNA program that each presents. We will provide you with an overview of the advantages that each educational institute can bring you to help you decide where you can enroll. This school in Detroit has a 75-hour nursing assistant program which will provide you a quick but reasonable time to learn about the health care requirements of Michigan. They are driven by their mission to provide quality and affordable CNA classes in Michigan for every medical student. They provide a CNA course that also features a phlebotomy training. A phlebotomy career training is offered in a CNA class in Hazy. Being a phlebotomist will let you specialize in making proper incisions. The process of phlebotomy aims to effectively collect blood from a patient for testing or transfusion purposes. The Ross Medical Education Center prides itself on offering CNA classes in a fast, focused and friendly manner. They are conveniently located in various parts of the State of Michigan including Ann Arbor, Lansing, Taylor and Roosevelt Park. The class that they offer students who want to be have certification as nurse aides are top notch and not only recognized by the state of Michigan because they also have schools in the other parts of the US like Indiana, Ohio, West Virgina and Kentucky. This school is located in Lansing. They aim to achieve excellence in everything that they do by incorporating the factors of honesty, care, cooperation, originality, diversity, respect and understanding in training their students how to be a successful nursing assistant someday. They have been giving health care training since the year 2007. Their dedication and ability to answer the needs of their students through their CNA program is what makes them stand out to this day. Kellogg Community College has been serving the public since its establishment in 1956. It is a school accredited by the Higher Learning Commission of the US North Central Association of Colleges and Schools. To date, it has more than 14,600 students taking up various courses. The CNA classes that they provide features up to date techniques, research and information that aim to answer the ever increasing need for nursing assistants. Their CNA classes target to develop concern for the needs of others, enhancement of communication skills, critical thinking, practical application of theories and the value of professionalism. This international organization provides CNA classes in Michigan with a total of 171 hours. This may be quite long as compared to other alternatives but what their aim is not just to help you finish the course in a quick span of time. Their goal is to ensure that you will be well-equipped with all the skills and knowledge that you need through their comprehensive CNA classes in Michigan coupled with a well-devised training program. Going to a school that specializes in providing quality education for students seeking to be a successful nursing assistant is important in your personal development and career. The Certified Nursing Assistant courses in Michigan that are presented here will almost guarantee your admission and successful completion of the CNA exam given by the nursing board of Michigan. Quality Michigan CNA classes from these schools will also provide you a way to score high in the Michigan nurse aide exams, which will surely let you get noticed by the top health care institutions and other establishments in MI. Getting noticed by the major employers that are hiring certified CAN’s course will certainly offer you a good job in the future, which will really ensure you a good and stable paycheck as well. So enroll in CNA classes in Michigan now from one of these featured schools to ensure that you are already on your first step to success.